Don't force it It's important to remember, first of all, that there is just no point in forcing a blog post. It will just hurt your poor brain trying to come up with ideas and probably put you in a bit of a mood when you just can't seem to get it right. Plus it's quality, not quantity. I know I would rather read 2 good posts a week than one 'meh' post a day. Remind people of your old posts I think us bloggers often forget that, just because content isn't fresh and new, it doesn't mean that it can't be revisited. If you haven't got a new post to tell your readers about, then simply tweet about a post you did a while ago that you really liked. Chances are, you may have gained some new readers since then who've never even read that post in the first place. Or perhaps an old post is relevant to something current. Eg. throwing out a baking post every Wednesday when it's bake off day is MORE than acceptable! Take photos of what you're doing If you find yourself really busy but you're busy doing something actually fun then take photos of it for a future blog post! Perhaps you can't blog about your travels at the moment but, in a weeks time, when you're back and ready to write then your pictures will probably help the words flow a lot better. Use social media instead Let's be honest - there is always time to send a quick tweet or take a sneaky shot of your morning Starbs to upload to Insta, ain't there? Keeping active on social media can be done on the go and doesn't take anywhere near as much time and effort as maintaining your blog does but, as most of our social media accounts are linked to our blogs, it just means that people know you're still around! And if they do see a tweet from you they just might click on your profile and pop over to your blog. 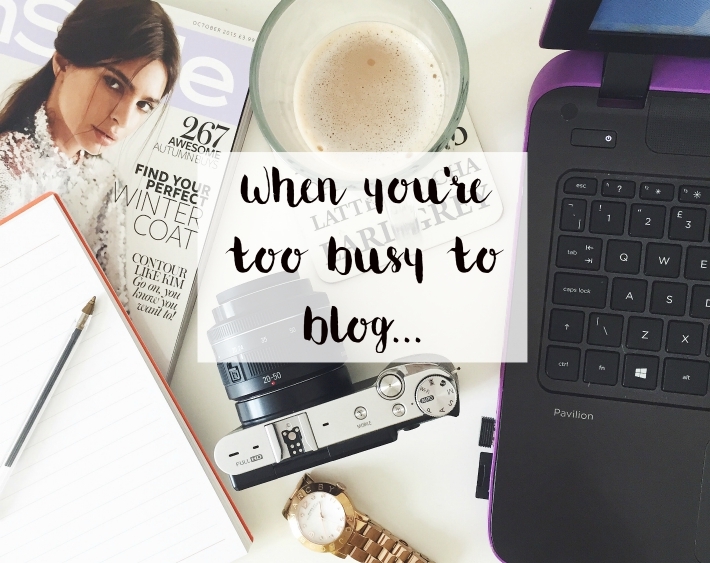 What do you do when you're too busy to blog?